This past September, MiLB.com's Ben Hill completed his #BenEverywhere goal of having visited all 159 active affiliated Minor League Baseball ballparks. He's visited 172 Minor League ballparks overall, many of them multiple times. This marks the seventh -- and final -- "Ben's Best" article, in which Hill recaps his favorite people, places and things from his many seasons of professional travel. After covering everything from food to mascots to people to ballparks to views to stadium features, today the "Ben's Best" article series concludes with one of Minor League Baseball's most frequent conversation topics: logos. What follows is a level-by-level list of my favorite Minor League logos. What are yours? The Redbirds, a St. Louis Cardinals affiliate, unveiled new logos prior to the 2017 season. Owner Peter Freund, who bought the team from the Cardinals a year earlier, said that the intent was to "embrace Memphis as authentically as possible." The resulting logo set, designed by Studio Simon, nods to Beale Street nightlife by featuring the team name in neon. It's a sleek, vibrant look, one that simultaneous represents the parent club and the city that the team calls home. The Lookouts, named for Chattanooga's Lookout Mountain, can lay claim to having the second-oldest team name in all of Minor League Baseball. In 1993, some 108 years after the moniker was first utilized, the team debuted its now-iconic logo. A pair of cartoonish, heavy-lidded eyes are nestled within a Chattanooga "C;" those eyes are presumably "looking out" upon Lookout Mountain. The end result is whimsical, original and instantly recognizable. Chattanooga's not the only Minor League team sporting iconic eyes. For exhibit B, we turn to Lake Elsinore. When the Storm debuted in 1994, the primary logo's determined, red-pupiled eyes were embedded within a literal storm cloud. The team removed the cloud in 2000, resulting in a minimalist and menacing look that was soon everywhere. If you keep your own eyes open, it's likely that sooner or later you'll spot someone wearing a Lake Elsinore cap. 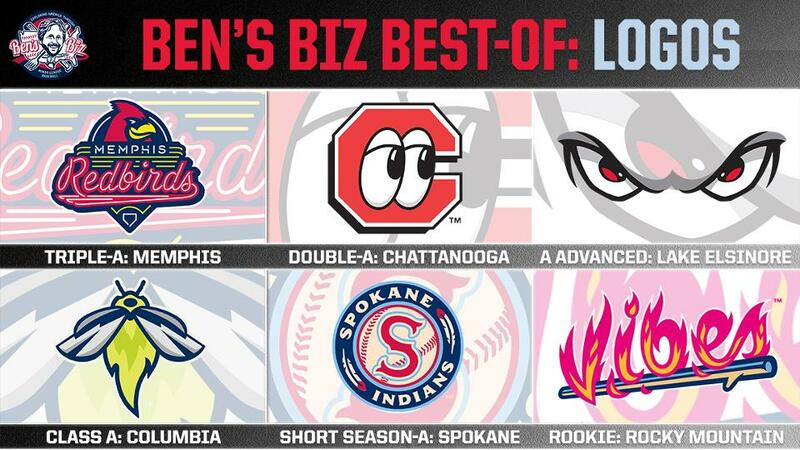 Prior to its inaugural 2016 season, Columbia bucked prevailing Minor League trends by unveiling a comparatively sparse and simple team name and logo. The Firefly in question, created by Sky Design, is sleek, streamlined and entirely devoid of human characteristics. But there is still plenty of personality, thanks to the (literally) glowing color scheme. The "luminous neon flame at the base of the abdomen" represents Columbia's reputation as a scorching locale -- the city's slogan is "Famously Hot." In last week's article on "Best Ballpark Features" I highlighted the Spokane Indians' unique ballpark signage: the Spokane tribe's Salish language is featured alongside English. This unique endeavor was an outgrowth of the team's 2006 rebranding, designed by Brandiose following dialogue between the team and the Spokane tribe. The roundel primary logo features two eagle feathers, a sacred symbol of Spokane tribal culture. Upon the release of the logo, the Spokane Tribal Council stated that they "hope other Indian-named organizations across the country keep this ground-breaking concept in mind with their own neighboring Indian tribes." The Colorado Springs-based Vibes, formerly the Helena Brewers, make their Pioneer League debut in 2019. The team name and logos, unveiled last week, add a jolt of 21st-century irreverence to the Minor Leagues' most aesthetically staid level. 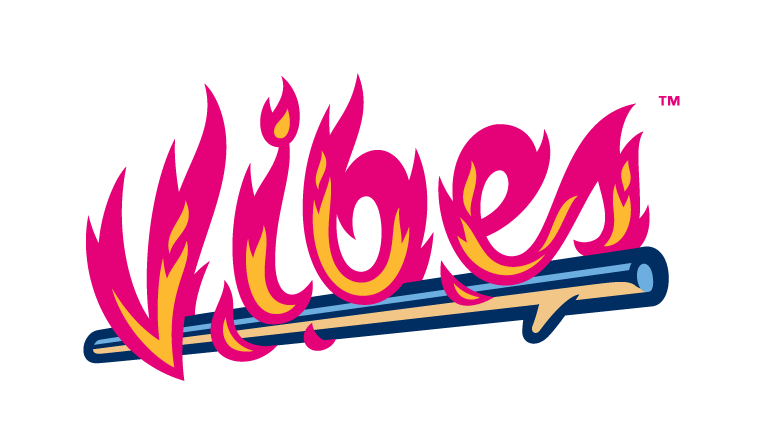 The vibe-rant primary logo, part of a larger camping (and s'mores) theme, features "Vibes" spelled out in flames over a stick. That stick could, at least theoretically, be used to roast marshmallow mascot Toasty Vibes.